Our aim is to provide customers with an opportunity to test out makeup products that you normally wouldn’t buy on your own. We offer customers with products that are not only a great addition to your everyday routine, but are perfect to try without the worry of spending your paycheck. We did this by combining awesome products from popular makeup brands and adding them into budget-friendly mystery boxes that are fantastic as a gift or that can be bought as a treat for yourself. You may receive products starting from basic necessities like mascara or lipstick to skincare routine items like an exfoliator or facemasks that can be used for that day off from work you were planning. Customers can expect to receive goods from brands such as RIMMEL, L’Oreal, Revlon, Maybelline, ColourPop, Benefit Cosmetics, Tarte, MAC, Urban Decay, NYX and many more. In addition, we also try to mix it up by adding cosmetic accessories like makeup bags and makeup brushes. 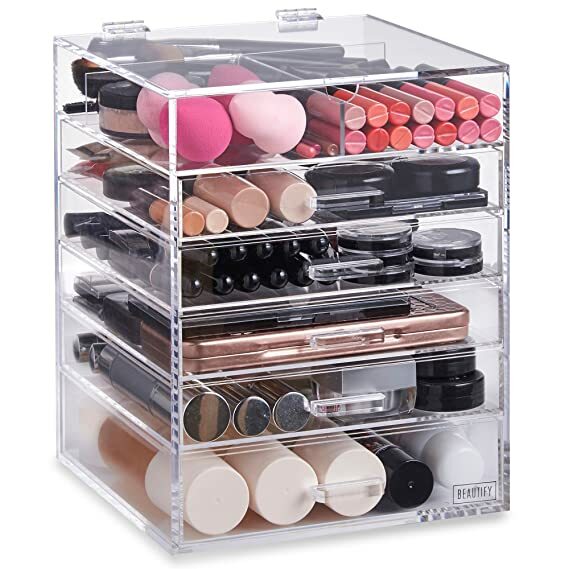 Looking for a gift for that makeup lover in your life? Why not buy a beauty mystery box to surprise that special someone? Buying beauty mystery boxes provides diversity, as it holds a number of beauty products that are perfect for any makeup addict as they are able to test out products and find out favourites. Using mystery boxes as a gift provides the giver (that’s you!) with a stress-free selection of presents you normally wouldn’t find at that price, which means you never have to break your budget. I bet you are asking yourself, “How do they do it?” The answer is simple. Our passion lies within searching for products that popular within the beauty world, as well as sticking to those cult favourites that beauty lovers swear by. Not convinced you’ll like the products? One of the ways we are offering insight to our customers is ensuring that you are connected to our social media plugins. Our Facebook and Instagram allows customers gain an exclusive insight into what type of products available for mystery boxes. In order to gain the best products, you have to act fast! All of the products we offer have limited availability, which means they sell out quick! But not to worry, we are constantly adding new products so there are always great brands to try out! Received an order from us? We would love to hear your opinion! Send us a message telling us how we can improve our shopping experience or even send us a selfie showing off what you got! By providing a product review, you are able to give insight to future buyers what they can potentially receive. Basically, what we are trying to say is try out our products so you can understand why we believe our mystery boxes are awesome and the ideal purchase for you or your friends. http://ukmysteryboxes.co.uk is a participant in the Amazon Services LLC Associates Program, an affiliate advertising program designed to provide a means for sites to earn advertising fees by advertising and linking to amazon.co.uk.